Derek McInnes insists the credit for Aberdeen's second-half revival against Ross County goes to his players. The Dons were jeered off at the interval after trailing from Craig Curran's early strike. Goals from Adam Rooney, Jonny Hayes and Niall McGinn turned the game in the host's favour as they won 3-1. "The players did that themselves as they showed real responsibility in the second half and real determination to get the result," said McInnes. The suspicion was the manager had given them the sort of dressing down on the club's Retro Day that used to be the preserve of Sir Alex Ferguson. They certainly came blasting back out like a team transformed after the break and, within eight minutes, goals from Adam Rooney and Jonny Hayes had them ahead. 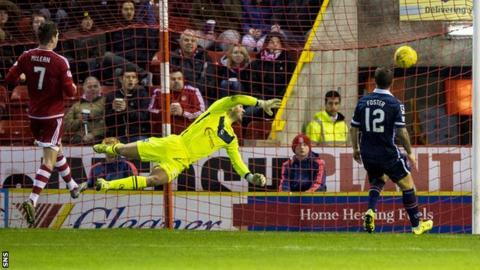 Niall McGinn capped a fine individual display with a late third to take Aberdeen back into second place. "I couldn't have been more pleased with how they played from the first whistle in that second half," McInnes told BBC Scotland. "It was relentless, thoughtful, intense, intelligent and some real quality play as well. "The first half was more nervy than it should have been because of the poor goal we lost, but we still had time to put it right and the players did that. "They deserve all the credit. It's not about what anyone said to them." Aberdeen have now gone three games undefeated as they begin to find the form that had them top of the table and moved above Hearts and cut the gap on leaders Celtic to four points. "We recognise we play for ourselves and nobody is going to do us any favours so we have to deal with difficult situations and that's what we did," said the Dons manager. "There is an intensity and challenge when you play for Aberdeen to win games all the time and our supporters are used to see us winning. "We have only lost once at home this season. Now we are back in to second place so as things are we are doing alright." Ross County manager Jim McIntyre was as stunned as his players at their reversal of fortune after the break and believes his side need to be more streetwise to pick up points on the road. They have won just once away from home in the league this season and that was at Kilmarnock back in August, but McInytre said they blew the chance to end that statistic. "We dominated the first half and should have been more goals ahead at half time and it came back to bite us when we didn't," he said. "When things like that happen, it is sore to take, but we produced enough good things to have got something. "The goals we gave away were really disappointing as we can defend better than that and Aberdeen won the battles in the second half as we didn't match them. "I can take a lot from the way we played first half and it was much better than the last time when we were thumped 4-0 here, so there has been progress."